July | 2015 | Genesis Nanotechnology, Inc.
Canada could be propelled to the forefront of quantum materials research thanks to an investment by the government into a new research program at the University of British Columbia. The Quantum Matter Institute, which is already acknowledged as a global leader in its field, will use the funds to explore and develop high-tech quantum materials that could lead to pioneering technology in Canada in computing and electronic devices. Today’s announcement follows an open and competitive selection process among Canadian universities and colleges, judged by a panel of Canadian and international experts. Launched in December 2014 by Prime Minister Stephen Harper, the Canada First Research Excellence Fund will invest $1.5 billion over seven years to propel Canadian colleges and universities to excel globally in research areas that create long-term economic advantages for Canadians. Today’s award is part of the Fund’s first $350 million competition. — The Fund is administered by the Social Sciences and Humanities Research Council of Canada (SSHRC) on behalf of the three granting agencies: the SSHRC, the Natural Sciences and Engineering Research Council of Canada, and the Canadian Institutes of Health Research. As set out in Economic Action Plan 2015 and the renewed science, technology and innovation strategy, the Government is committed to supporting world-class research talent and infrastructure that is essential to advanced discoveries in both the public and private sectors. New research from Rice University could make it easier for engineers to harness the power of light-capturing nanomaterials to boost the efficiency and reduce the costs of photovoltaic solar cells. Although the domestic solar-energy industry grew by 34 percent in 2014, fundamental technical breakthroughs are needed if the U.S. is to meet its national goal of reducing the cost of solar electricity to 6 cents per kilowatt-hour. In a study published July 13 in Nature Communications, scientists from Rice’s Laboratory for Nanophotonics (LANP) describe a new method that solar-panel designers could use to incorporate light-capturing nanomaterials into future designs. 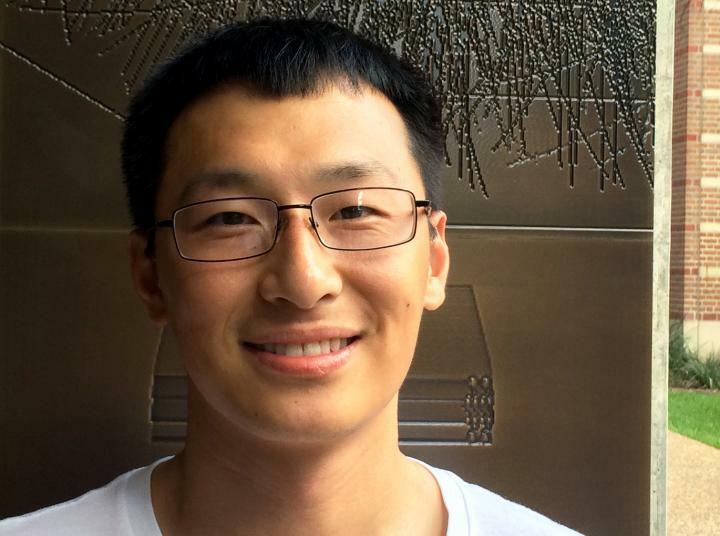 By applying an innovative theoretical analysis to observations from a first-of-its-kind experimental setup, LANP graduate student Bob Zheng and postdoctoral research associate Alejandro Manjavacas created a methodology that solar engineers can use to determine the electricity-producing potential for any arrangement of metallic nanoparticles. LANP researchers study light-capturing nanomaterials, including metallic nanoparticles that convert light into plasmons, waves of electrons that flow like a fluid across the particles’ surface. For example, recent LANP plasmonic research has led to breakthroughs in color-display technology, solar-powered steam production and color sensors that mimic the eye. Halas, Rice’s Stanley C. Moore Professor of Electrical and Computer Engineering and professor of chemistry, bioengineering, physics and astronomy, and materials science and nanoengineering, said hot electrons are particularly interesting for solar-energy applications because they can be used to create devices that produce direct current or to drive chemical reactions on otherwise inert metal surfaces. Today’s most efficient photovoltaic cells use a combination of semiconductors that are made from rare and expensive elements like gallium and indium. Halas said one way to lower manufacturing costs would be to incorporate high-efficiency light-gathering plasmonic nanostructures with low-cost semiconductors like metal oxides. In addition to being less expensive to make, the plasmonic nanostructures have optical properties that can be precisely controlled by modifying their shape. The plasmonic approach has been tried before but with little success. He and Halas said Manjavacas, a theoretical physicist in the group of LANP researcher Peter Nordlander, conducted work in the new study that offers a fundamental insight into the underlying physics of hot-electron-production in plasmonic-based devices. He said a recent example of such work comes from a pioneering experiment by another Rice graduate student, Ali Sobhani, where the absorption was concentrated near a metal semiconductor interface. “From this perspective, one can determine the total number of electrons produced, but it provides no way of determining how many of those electrons are actually useful, high-energy, hot electrons,” Manjavacas said. He said Zheng’s data allowed a deeper analysis because his experimental setup selectively filtered high-energy hot electrons from their less-energetic counterparts. To accomplish this, Zheng created two types of plasmonic devices. Each consisted of a plasmonic gold nanowire atop a semiconducting layer of titanium dioxide. In the first setup, the gold sat directly on the semiconductor, and in the second, a thin layer of pure titanium was placed between the gold and the titanium dioxide. The first setup created a microelectronic structure called a Schottky barrier and allowed only hot electrons to pass from the gold to the semiconductor. The second setup allowed all electrons to pass. LANP researchers and others have spent years developing techniques to bolster the field-intensity enhancement of photonic structures for single-molecule sensing and other applications. Zheng and Manjavacas said they are conducting further tests to modify their system to optimize the output of hot electrons. Additional co-authors include Hangqi Zhao and Michael McClain, both of Rice. The research was supported by the Welch Foundation, the Office of Naval Research and the Air Force Office of Science and Research. Nanomaterials and UV light can “trap” chemicals for easy removal from soil and water. Many human-made pollutants in the environment resist degradation through natural processes, and disrupt hormonal and other systems in mammals and other animals. Removing these toxic materials — which include pesticides and endocrine disruptors such as bisphenol A (BPA) — with existing methods is often expensive and time-consuming. 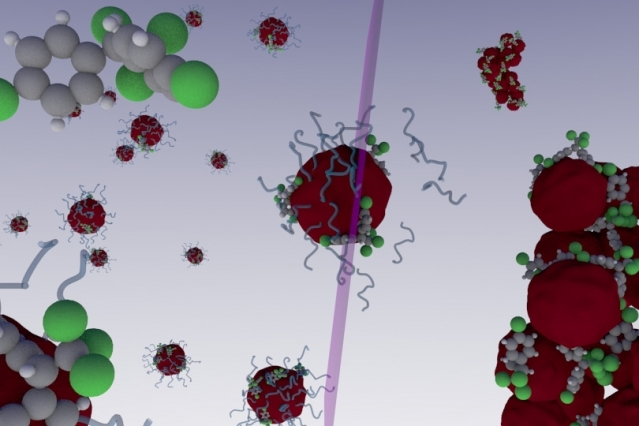 In a new paper published this week in Nature Communications, researchers from MIT and the Federal University of Goiás in Brazil demonstrate a novel method for using nanoparticles and ultraviolet (UV) light to quickly isolate and extract a variety of contaminants from soil and water. Ferdinand Brandl and Nicolas Bertrand, the two lead authors, are former postdocs in the laboratory of Robert Langer, the David H. Koch Institute Professor at MIT’s Koch Institute for Integrative Cancer Research. (Eliana Martins Lima, of the Federal University of Goiás, is the other co-author.) Both Brandl and Bertrand are trained as pharmacists, and describe their discovery as a happy accident: They initially sought to develop nanoparticles that could be used to deliver drugs to cancer cells. Nanoparticles that lose their stability upon irradiation with light have been designed to extract endocrine disruptors, pesticides, and other contaminants from water and soils. The system exploits the large surface-to-volume ratio of nanoparticles, while the photoinduced precipitation ensures nanomaterials are not released in the environment. Brandl had previously synthesized polymers that could be cleaved apart by exposure to UV light. But he and Bertrand came to question their suitability for drug delivery, since UV light can be damaging to tissue and cells, and doesn’t penetrate through the skin. When they learned that UV light was used to disinfect water in certain treatment plants, they began to ask a different question. The researchers synthesized polymers from polyethylene glycol, a widely used compound found in laxatives, toothpaste, and eye drops and approved by the Food and Drug Administration as a food additive, and polylactic acid, a biodegradable plastic used in compostable cups and glassware. Nanoparticles made from these polymers have a hydrophobic core and a hydrophilic shell. Due to molecular-scale forces, in a solution hydrophobic pollutant molecules move toward the hydrophobic nanoparticles, and adsorb onto their surface, where they effectively become “trapped.” This same phenomenon is at work when spaghetti sauce stains the surface of plastic containers, turning them red: In that case, both the plastic and the oil-based sauce are hydrophobic and interact together. If left alone, these nanomaterials would remain suspended and dispersed evenly in water. But when exposed to UV light, the stabilizing outer shell of the particles is shed, and — now “enriched” by the pollutants — they form larger aggregates that can then be removed through filtration, sedimentation, or other methods. The researchers used the method to extract phthalates, hormone-disrupting chemicals used to soften plastics, from wastewater; BPA, another endocrine-disrupting synthetic compound widely used in plastic bottles and other resinous consumer goods, from thermal printing paper samples; and polycyclic aromatic hydrocarbons, carcinogenic compounds formed from incomplete combustion of fuels, from contaminated soil. The fundamental breakthrough, according to the researchers, was confirming that small molecules do indeed adsorb passively onto the surface of nanoparticles. “To the best of our knowledge, it is the first time that the interactions of small molecules with pre-formed nanoparticles can be directly measured,” they write in Nature Communications. Even more exciting, they say, is the wide range of potential uses, from environmental remediation to medical analysis. The polymers are synthesized at room temperature, and don’t need to be specially prepared to target specific compounds; they are broadly applicable to all kinds of hydrophobic chemicals and molecules. And the nanoparticles’ high surface-area-to-volume ratio means that only a small amount is needed to remove a relatively large quantity of pollutants. The technique could thus offer potential for the cost-effective cleanup of contaminated water and soil on a wider scale. This approach could possibly be further developed, he speculates, to replace the widespread use of organic solvents for everything from decaffeinating coffee to making paint thinners. Bertrand cites DDT, banned for use as a pesticide in the U.S. since 1972 but still widely used in other parts of the world, as another example of a persistent pollutant that could potentially be remediated using these nanomaterials. “And for analytical applications where you don’t need as much volume to purify or concentrate, this might be interesting,” Bertrand says, offering the example of a cheap testing kit for urine analysis of medical patients. The study also suggests the broader potential for adapting nanoscale drug-delivery techniques developed for use in environmental remediation. “That we can apply some of the highly sophisticated, high-precision tools developed for the pharmaceutical industry, and now look at the use of these technologies in broader terms, is phenomenal,” says Frank Gu, an assistant professor of chemical engineering at the University of Waterloo in Canada, and an expert in nanoengineering for health care and medical applications. A synthetic membrane that self assembles and is easily produced may lead to better gas separation, water purification, drug delivery and DNA recognition, according to an international team of researchers. 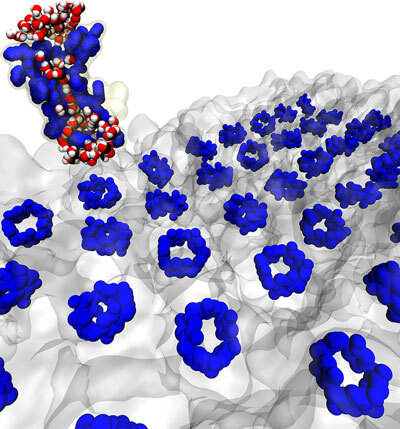 This biomimetic membrane is composed of lipids — fat molecules — and protein-appended molecules that form water channels that transfer water at the rate of natural membranes, and self-assembles into 2-dimensional structures with parallel channels. The researchers developed a second-generation synthetic water channel that improves on earlier attempts to mimic aquaporins – natural water channel proteins — by being more stable and easier to manufacture. The peptide-appended pillararenes (PAP) are also more easily produced and aligned than carbon nanotubes, another material under investigation for membrane separation. Kumar and co-authors report their development in a recent issue of the Proceedings of the National Academy of Science (“Highly permeable artificial water channels that can self-assemble into two-dimensional arrays”). The researchers consider that the PAP membranes are an order of magnitude better than the first-generation artificial water channels reported to date. The propensity for these channels to automatically form densely packed arrays leads to a variety of engineering applications. “The most obvious use of these channels is perhaps to make highly efficient water purification membranes,” said Kumar. MIT is a key player in a new $600 million public-private partnership announced today by the Obama administration to help strengthen high-tech U.S.-based manufacturing. Physically headquartered in New York state and led by the State University of New York Polytechnic Institute (SUNY Poly), the American Institute for Manufacturing Integrated Photonics (AIM Photonics) will bring government, industry, and academia together to advance domestic capabilities in integrated photonic technology and better position the U.S. relative to global competition. Federal funding of $110 million will be combined with some $500 million from AIM Photonics’ consortium of state and local governments, manufacturing firms, universities, community colleges, and nonprofit organizations across the country. Technologies that can help to integrate photonics, or light-based communications and computation, with existing electronic systems are seen as a crucial growth area as the world moves toward ever-greater reliance on more powerful high-tech systems. What’s more, many analysts say this is an area that could help breathe new life into a U.S. manufacturing base that has been in decline in recent years. The public-private partnership announced today aims to spur these twin goals, improving integration of photonic systems while revitalizing U.S. manufacturing. The consortium includes universities, community colleges, and businesses in 20 states. Six state governments, including that of Massachusetts, are also supporting the project. MIT faculty will manage important parts of the program: Michael Watts, an associate professor of electrical engineering and computer science, will lead the technological innovation in silicon photonics. Lionel Kimerling, the Thomas Lord Professor in Materials Science and Engineering, will lead a program in education and workforce development. MIT’s existing collaboration with SUNY Poly led to the first complete 300-millimeter silicon photonics platform, Watts says. That effort has led to numerous subsequent advances in silicon photonics technology, with MIT developing photonic designs that SUNY Poly has then built in its state-of-the-art fabrication facility. Photonic devices are seen as key to continuing the advances in computing speed and efficiency described by Moore’s Law — which may have reached their theoretical limits in existing silicon-based electronics, Kimerling says. The integration of photonics with electronics promises not only to boost the performance of systems in data centers and high-performance computing, but also to reduce their energy consumption — which already accounts for more than 2 percent of all electricity use in the U.S.
Kimerling points out that a single new high-performance computer installation can contain more than 1 million photonic connections between hundreds of thousands of computer processor units (CPUs). “That’s more than the entire telecommunications industry,” he says — so creating new, inexpensive, and energy-efficient connection systems at scale is a major need. The integration of such systems has been progressing in stages, Kimerling says. Initially, the conversion from optical to electronic signals became pervasive at the network level to support long-distance telecommunication, but it is now moving to circuit boards, and will ultimately go to the level of individual integrated-circuit chips. Within the new alliance, MIT will lead technological innovation in silicon photonics. That task will be managed by Watts. The evolving integration of photonics and electronics will have a great impact on many different technologies, Watts says. For example, LIDAR systems — similar to radar, but using light beams instead of radio waves — have great potential for collision-avoidance systems in cars, since they can provide greater detail than radar or sonar. Watts has worked to develop single-chip LIDAR devices, which could eliminate the moving parts in existing devices — such as tiny gimbaled mirrors used to direct the light beams in a scanning pattern — replacing them with fixed, electrically steerable phased-array systems, like those now used for cellphone tower antennas. “LIDAR systems that exist today are both bulky and expensive, because they use mechanically scanned lasers,” Watts says. But doing the same thing at the nanoscale, using phased-array systems on a chip, could drastically reduce size and cost, providing high-resolution, chip-scale, 3-D imaging capabilities that do not exist today, he says. There are many other areas where integration of photonics and electronics could lead to big advances, including in biological and chemical sensors that could have greater sensitivity than existing electronic versions, and in new kinds of medical imaging systems, such as optical coherent tomography. “The goal of this initiative is to lower the barriers to entry in this field for U.S. companies,” Watts says. It is intended to function much like a major public-private initiative that helped pave the way, decades ago, for the development of electronic chip manufacturing in the U.S. Significant photonic chip manufacturing capabilities have been developed at SUNY Poly, in Albany, New York. That facility has already made the world’s largest silicon-based photonic circuit, a chip designed at MIT, and built using industry-standard 300-millimeter-wide silicon wafers, Watts says. MIT will also host AIM Photonics’ program in education and workforce development, which Kimerling will direct. This will include developing educational materials — ranging from K-12 through continuing education — to prepare future employees for this emerging industry, including teaching on the design of integrated photonic devices. MIT will also lead workforce development, with an emphasis on including veterans, underrepresented minorities, and other students, by developing a variety of materials to teach about the new technologies. MIT will work to support internships, apprenticeships, and other forms of hands-on training in a national network of industry and university partners. The effort will also support an industry-wide roadmap to help align the technology supply chain with new manufacturing platforms. Kimerling says that a significant issue in developing a robust photonics industry is the need to develop a trained workforce of people who are familiar with both electronics and optical technology — two very different fields. Educational programs that encompass these disparate fields “are important, and don’t exist today in one organization,” he says. One expected impact of the new initiative is the development of a corridor along Interstate 90, from Boston to Rochester, New York, of industrial firms building on the base of new technology to develop related products and services, much as Silicon Valley emerged in California around companies such as Intel and their chip-making technology. Other major members of AIM Photonics include the University of Arizona, the University of Rochester, and the University of California at Santa Barbara. In addition to the Department of Defense, federal funding for the project will come from the National Science Foundation, the Department of Energy, the National Institute for Standards and Technology, and NASA. AMP was inaugurated with former MIT President Susan Hockfield as co-chair; MIT President L. Rafael Reif subsequently served in that same capacity as part of “AMP 2.0.” Those groups’ work led to President Barack Obama’s commitment to establish a National Network of Manufacturing Innovation, to consist of linked institutes such as the one announced today. Penn State Univ. engineers have developed a new “portable power supply” that will make it easier to manufacture plastics, therapeutics, fuels and other chemicals from sustainable feedstocks using diverse microbial organisms. Their engineered system is analogous to the power supply inside all computers that plugs into power sockets and converts fluctuating AC power into a smooth DC current. Manish Kushwaha, a post-doctoral fellow in agricultural and biological engineering, worked with Salis to build the system. He engineered a genetic circuit that could supply the organism with a portable RNA polymerase, a key enzyme responsible for reading DNA and making RNA, which is central to expressing the organism’s genes. But that wasn’t the difficult part. The solution was to introduce a genetic control system—a positive feedback loop and a negative feedback loop—so that RNA polymerase could be made in any bacterial cell regardless of differences in the cell’s genetic machinery. As reported in Nature Communications, Salis and Kushwaha demonstrated how their portable power supply works inside three very different bacterial organisms, showing how the same genetic parts could be used to make a recombinant protein and a 3-enzyme pathway. The researchers hope their work will accelerate synthetic biology efforts in less well-studied bacterial organisms to better take advantage of their natural manufacturing abilities. 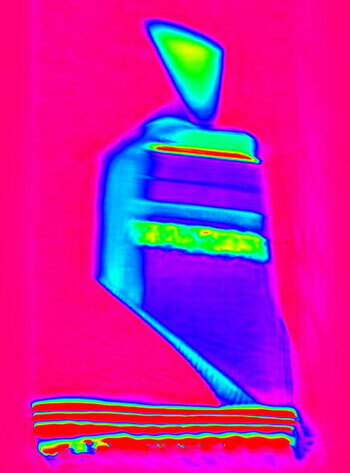 Photographs of upconversion in a cuvette containing cadmium selenide/rubrene mixture. The yellow spot is emission from the rubrene originating from (a) an unfocused continuous wave 800 nm laser with an intensity of 300 W/cm2. (b) a focused continuous wave 980 nm laser with an intensity of 2000 W/cm2. The photographs, taken with an iPhone 5, were not modified in any way. Credit: Zhiyuan Huang, UC Riverside. Solar energy could be made cheaper if solar cells could be coaxed to generate more power. When it comes to installing solar cells, labor cost and the cost of the land to house them constitute the bulk of the expense. The solar cells — made often of silicon or cadmium telluride — rarely cost more than 20 percent of the total cost. Solar energy could be made cheaper if less land had to be purchased to accommodate solar panels, best achieved if each solar cell could be coaxed to generate more power. A huge gain in this direction has now been made by a team of chemists at the University of California, Riverside that has found an ingenious way to make solar energy conversion more efficient. The researchers report in Nano Letters that by combining inorganic semiconductor nanocrystals with organic molecules, they have succeeded in “upconverting” photons in the visible and near-infrared regions of the solar spectrum. Bardeen added that these materials are essentially “reshaping the solar spectrum” so that it better matches the photovoltaic materials used today in solar cells. The ability to utilize the infrared portion of the solar spectrum could boost solar photovoltaic efficiencies by 30 percent or more. In their experiments, Bardeen and Tang worked with cadmium selenide and lead selenide semiconductor nanocrystals. The organic compounds they used to prepare the hybrids were diphenylanthracene and rubrene. The cadmium selenide nanocrystals could convert visible wavelengths to ultraviolet photons, while the lead selenide nanocrystals could convert near-infrared photons to visible photons. In lab experiments, the researchers directed 980-nanometer infrared light at the hybrid material, which then generated upconverted orange/yellow fluorescent 550-nanometer light, almost doubling the energy of the incoming photons. The researchers were able to boost the upconversion process by up to three orders of magnitude by coating the cadmium selenide nanocrystals with organic ligands, providing a route to higher efficiencies. Besides solar energy, the ability to upconvert two low energy photons into one high energy photon has potential applications in biological imaging, data storage and organic light-emitting diodes. Bardeen emphasized that the research could have wide-ranging implications. “The ability to move light energy from one wavelength to another, more useful region, for example, from red to blue, can impact any technology that involves photons as inputs or outputs,” he said. The research was supported by grants from the National Science Foundation and the US Army. The research was conducted also by the following coauthors on the research paper: Zhiyuan Huang (first author), Xin Li, Melika Mahboub, Kerry M. Hanson, Valerie M. Nichols and Hoang Le. Tang’s group helped design the experiments and provided the nanocrystals. The above post is reprinted from materials provided by University of California – Riverside. Note: Materials may be edited for content and length. Engineered carbon nanotube membranes may help solve our growing demand for desalination. Of course, you can’t just drink a glass of water straight from the sea. But it is possible to use water from the ocean once the salts are removed. In fact, desalination plants already provide much of the water used by people in many parts of the world, especially in Israel, Saudi Arabia, and Australia. Climate change is only increasing the demand for desalinated water as greater evaporation and rising seas further limit freshwater supplies for a growing world population. But desalinating water today comes at a very high cost in terms of energy, which means more greenhouse gases and more global warming. Researchers from the University of Malaya’s Nanotechnology and Catalysis Research Center in Kuala Lumpur in Malaysia say in the journal Desalination that carbon nanotube (CNT) membranes have a bright future in helping the world’s population meet the need for purified water from the sea. “Currently, about 400 million people are using desalinated water and it has been projected that by 2025, 14 percent of the global population will be forced to use sea water,” said Md. Eaqub Ali, corresponding author of the paper presenting the current problems and future challenges in water treatments. Existing desalination plants rely on reverse osmosis, vacuum distillation, or a combination of the two, he explained. But those methods are energy intensive, and that’s where the potential for carbon nanotube membranes comes in. Carbon nanotubes are teeny tiny hexagonal tubes, made by rolling sheets of graphene, said Rasel Das, first author of the paper. They require little energy and can be designed to specifically reject or remove not only salt, but also common pollutants. “The hollow pores of the CNTs are extremely, extremely tiny,” Ali said. 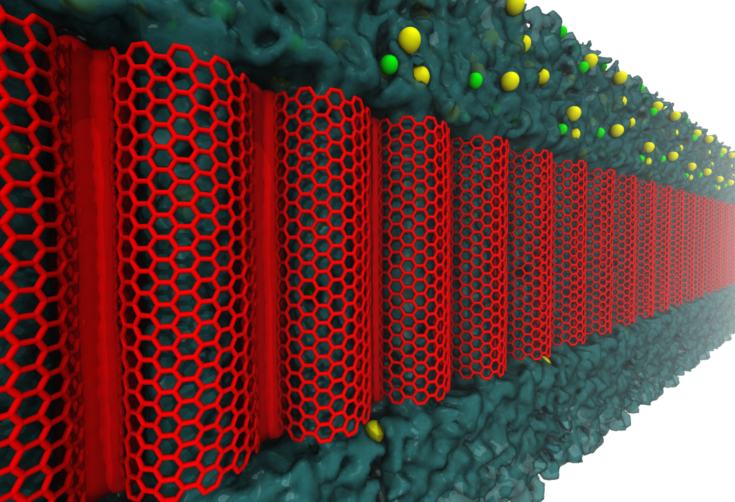 “However, because of their amazing chemical and physical properties, they allow frictionless passes of water through the pores, but reject most salts, ions, and pollutants, giving us purified water, probably in its best form.” An array of carbon nanotubes (red) forming a membrane that is highly permeable to water (blue surface), but not sodium (yellow) and chloride (green) ions. That frictionless property is what gives CNTs the potential to purify water with so little energy. And carbon nanotube membranes come with other perks, Das added, including self-cleaning properties. “What makes CNTs special is that they have cytotoxic properties,” he said. That means that the membranes naturally kill microbes that might otherwise foul up their surfaces. As a result, carbon nanotube membranes have the potential to last longer much longer than those in use today. There are hurdles yet to overcome, co-author of the paper Sharifah Bee Abd Hamid said. The CNT membranes themselves are now costly to produce, especially for large-scale uses. Research is also needed to produce the membranes with pores of a more uniform distribution and size. “Most progress in desalination research is focused on demonstrating the capability of CNT membranes at a small scale,” she said. For larger scale operations, work is needed to produce CNT membranes on thin films or fiber cloth composites. Getting CNT membranes ready for use will require effort on material design, operational requirements, and more. Only 2 percent of the water on Earth comes in the form of freshwater. Of that 2 percent, 70 percent is snow and ice, 30 percent is hidden underground, and less than 0.5 percent is found in surface waters including lakes, ponds and rivers. University of Texas at Dallas scientists have constructed novel fibers by wrapping sheets of tiny carbon nanotubes to form a sheath around a long rubber core. This illustration shows complex two-dimensional buckling, shown in yellow, of the carbon nanotube sheath/rubber-core fiber. The buckling results in a conductive fiber with super elasticity and novel electronic properties. An international research team based at The University of Texas at Dallas has made electrically conducting fibers that can be reversibly stretched to over 14 times their initial length and whose electrical conductivity increases 200-fold when stretched. The research team is using the new fibers to make artificial muscles, as well as capacitors whose energy storage capacity increases about tenfold when the fibers are stretched. Fibers and cables derived from the invention might one day be used as interconnects for super-elastic electronic circuits; robots and exoskeletons having great reach; morphing aircraft; giant-range strain sensors; failure-free pacemaker leads; and super-stretchy charger cords for electronic devices. In a study published in the July 24 issue of the journal Science, the scientists describe how they constructed the fibers by wrapping lighter-than-air, electrically conductive sheets of tiny carbon nanotubes to form a jelly-roll-like sheath around a long rubber core. The new fibers differ from conventional materials in several ways. For example, when conventional fibers are stretched, the resulting increase in length and decrease in cross-sectional area restricts the flow of electrons through the material. But even a “giant” stretch of the new conducting sheath-core fibers causes little change in their electrical resistance, said Dr. Ray Baughman, senior author of the paper and director of the Alan G. MacDiarmid NanoTech Institute at UT Dallas. One key to the performance of the new conducting elastic fibers is the introduction of buckling into the carbon nanotube sheets. Because the rubber core is stretched along its length as the sheets are being wrapped around it, when the wrapped rubber relaxes, the carbon nanofibers form a complex buckled structure, which allows for repeated stretching of the fiber. “Think of the buckling that occurs when an accordion is compressed, which makes the inelastic material of the accordion stretchable,” said Baughman, the Robert A. Welch Distinguished Chair in Chemistry at UT Dallas. Dr. Zunfeng Liu, lead author of the study and a research associate in the NanoTech Institute, said the structure of the sheath-core fibers “has further interesting and important complexity.” Buckles form not only along the fiber’s length, but also around its circumference. By adding a thin overcoat of rubber to the sheath-core fibers and then another carbon nanotube sheath, the researchers made strain sensors and artificial muscles in which the buckled nanotube sheaths serve as electrodes and the thin rubber layer is a dielectric, resulting in a fiber capacitor. These fiber capacitors exhibited a capacitance change of 860 percent when the fiber was stretched 950 percent. “No presently available material-based strain sensor can operate over nearly as large a strain range,” Liu said. Adding twist to these double-sheath fibers resulted in fast, electrically powered torsional — or rotating — artificial muscles that could be used to rotate mirrors in optical circuits or pump liquids in miniature devices used for chemical analysis, said Dr. Carter Haines BS’11, PhD’15, a research associate in the NanoTech Institute and an author of the paper. In the laboratory, Nan Jiang, a research associate in the NanoTech Institute, demonstrated that the conducting elastomers can be fabricated in diameters ranging from the very small — about 150 microns, or twice the width of a human hair — to much larger sizes, depending on the size of the rubber core. “Individual small fibers also can be combined into large bundles and plied together like yarn or rope,” she said. Last year, UT Dallas licensed to Lintec of America a process Baughman’s team developed to transform carbon nanotubes into large-scale structures, such as sheets. Lintec opened its Nano-Science & Technology Center in Richardson, Texas, less than 5 miles from the UT Dallas campus, to manufacture carbon nanotube aerogel sheets for diverse applications. The above post is reprinted from materials provided by University of Texas, Dallas. Note: Materials may be edited for content and length. Will Nanotechnology Provide a Path to a Sustainable Energy Future? By Michael Berger – Nanowerk. During 2002 and 2003, Nobel laureate Richard E. Smalley developed a list of the Top Ten Problems Facing Humanity over the next 50 years. The Richard E. Smalley Institute for Nanoscale Science and Technology at Rice University (which in May 2015 has been merged with the Rice Quantum Institute into a new entity: the Smalley-Curl Institute) has identified 5 of these problems as society’s Grand Challenges – and energy tops the list. Since then, researchers around the world have demonstrated the potential for nanotechnology to be a key technology on the path to a sustainable energy future. Against the double-whammy backdrop of an energy challenge – the world’s appetite for energy keeps growing1 – plus a climate challenge – climate goals (2°C target) require substantial reduction in greenhouse gases (see: Climate change: Action, trends and implications for business. pdf) – it is the role of innovative energy technologies to provide socially acceptable solutions through energy savings; efficiency gains; and decarbonization. Why is nanotechnology relevant here? Many effects important for energy happen at the nanoscale: In solar cells, for instance, photons can free electrons from a material, which can then flow as an electric current; the chemical reactions inside a battery or fuel cell release electrons which then move through an external circuit; or the role of catalysts in a plethora of chemical reactions. These are just a few examples where nanoscale engineering can significantly improve the efficiency of the underlying processes. Nanotechnologies are not tied exclusively to renewable energy technologies. While researchers are exploring ways in which nanotechnology could help us to develop energy sources, they also develop techniques to access and use fossil fuels much more efficiently. Corrosion resistant nanocoatings, nanostructured catalysts, and nanomembranes have been used in the extraction and processing of fossil fuels and in nuclear power. There is no silver bullet – nanotechnology applications for energy are extremely varied, reflecting the complexity of the energy sector, with a number of different markets along its value chain, including energy generation, transformation, distribution, storage, and usage. Nanotechnology has the potential to have a positive impact on all of these – albeit with varying effects. Nanoporous insulating materials in the construction business can help reduce the energy needed to heat and cool buildings. The effectiveness of catalytic converters in vehicles can be increased by applying catalytically active precious metals in the nanoscale size range. We have compiled an overview of Nanotechnology in Energy that shows how nanotechnology innovations could impact each part of the value-added chain in the energy sector – energy sources; energy conversion; energy distribution; energy storage; and energy usage. The thermodynamic limit of 80% efficiency is well beyond the capabilities of current photovoltaic technologies, whose laboratory performance currently approaches only 43% 2. Nanomaterials even make it possible to raise light yield of traditional crystalline silicon solar cells. By using cheaper, nanoscale materials than the current dominant technology (single-crystal silicon, which uses a large amount of fossil fuels for production), the cost of solar cells could be brought down. Numerous research labs are working on nanotechnology-enabled batteries to increase their efficiencies for electric vehicles, home, or grid storage systems. Improving the efficiency/storage capacity of batteries and supercapacitors with nanomaterials will have a substantial economical impact. Graphene has already been demonstrated to have many promising applications in energy-related areas. (read more: “Graphene materials for energy storage applications“). Nanotechnology also has the potential to deliver the next generation lithium-ion batteries with improved performance, durability and safety at an acceptable cost (“The promise of nanotechnology for the next generation of lithium-ion batteries“). A major push on basic research for energy technologies is coming from the U.S. Department of Energy, which since 2009 has invested nearly $800m as part of the Energy Frontier Research Center (EFRC) program. For example, the Joint Center for Artificial Photosynthesis (JCAP) has developed a nanowire-based design that incorporates two semiconductors to enhance absorption of light; or the Nanostructures for Electrical Energy Storage (NEES) EFRC Center has demonstrated that precise nanostructures can be constructed to test the limits of 3-D nanobatteries by designing billions of tiny batteries inside nanopores. Against the double-whammy backdrop of an energy challenge and a climate challenge it is the role of innovative energy technologies to provide socially acceptable solutions through energy savings; efficiency gains; and decarbonization. So where does that leave ‘nanotechnology’? It may not be the silver bullet, but nanomaterials and nanoscale applications will have an important role to play.